7 days free trial | No credit card required. Our on-line business plan software enables you to create a professional business plan, with a relevant structure and nice formatting, so that you can present your project to banks and investors in confidence. Insert a chart, break even point analysis, financial analysis, or credit analysis in your business plan with just a couple clicks. We've got you covered with clear instructions and examples for each section of your business plan. Export your financial data in CSV format in order to analyse them with Excel or Google Sheets. 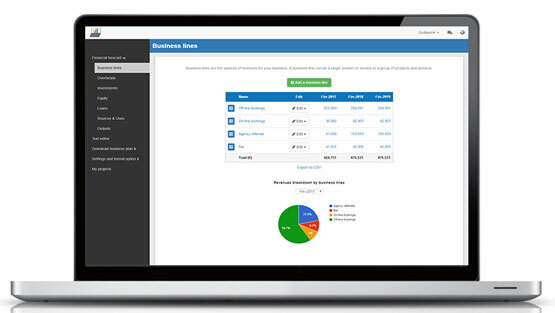 Our business plan software is 100% web based, so you don't need to install anything and can access your plan from anywhere with an Internet connection. Your business plan is confidential. We take the security of your data very seriously, your connection to our site is encrypted using the SSL protocol. Not sure where to input your data? A doubt about what to write in a section? Email our friendly support team, and we'll get back to you quickly with an answer. I was able to create a detailed business plan which made a strong impression on my bank and enabled me to get a loan for my business. The business Plan Shop is really useful to write a business plan fast and efficiently. Support is excellent. Save time, and pitch banks and investors with a professional business plan.